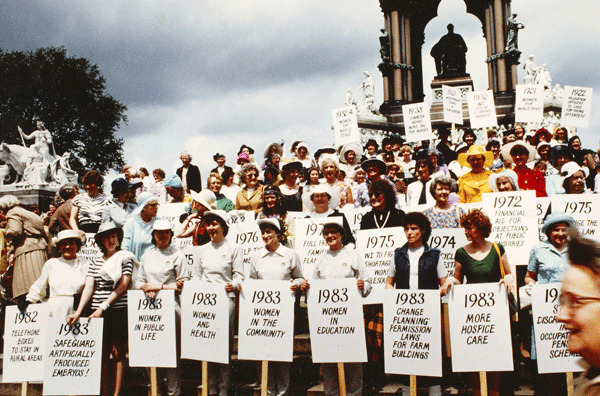 Members of the Women's Institute holding placards naming current and past campaigns, 1980s. The Library houses over 460 archives (arranged in 11 strands) that document women’s lives and the issues that have concerned and interested them. They date primarily from the mid-nineteenth century to the present day and extend in size from one file to hundreds of boxes. Included are the personal papers of a wide variety of individuals, ranging from the papers of the famous suffragette Emily Wilding Davison to the unpublished autobiography of romantic novelist Dame Barbara Cartland. The records of societies and associations are also covered, including female emigration societies, women’s suffrage associations, societies for the abolition of the state regulation of prostitution, societies for the suppression of traffic in persons, women’s employment organisations and a myriad of other pressure groups and campaigning organisations on issues as varied as peace, single parenthood, women clergy and home economics. The records of research and oral history projects are also collected. An online catalogue is now available for searching the archives.